When I first heard about Peak Oil, my reaction was basically, “That’s pretty bleak, but surely we’ll develop some technology to solve the problem”. I spent my working life in the power industry, I enjoyed learning the latest technologies and I thought I knew what we could potentially do. Fifteen years later, I am convinced that technology doesn’t hold the answer, at least not to the questions most people are asking of it. Because of the way our financial systems are set up, industrial civilization must continue to grow. The kind of growth we are talking about is exponential and in the real world it always runs into limits. As I’ve commented before, people don’t have a good grasp of how exponential growth works, and we always seem to be surprised by where it leads. While it might be worthwhile revisiting the idea of limits to growth at some point, today I want to focus on technology. First, let’s be clear how I feel about technology — it is an essential part of being human. When we are faced with a problem, we typically solve it by applying more complex technology. Sometimes this leads us into a corner, a “progress trap”, and we are forced to simplify. But we rarely do it willingly. It seems to me we are currently caught in one of those progress traps, based on our reliance on fossil fuels--a dead end because those resources are becoming depleted. The way out is through simplification of our technology, not further investment in complexity. I think the enlightenment was a good thing--it added some very important thinking tools (critical thinking and the scientific method, along with all sorts of new mathematics) to our mental tool kit. The enlightenment and heat engines for converting fuels into mechanical power were two separate, necessary but not sufficient conditions for the development of industrial civilization. Put them together and voila, industrial revolution. Many people who have thought about this are not convinced that it was a good thing. I'll agree that when taken too far, it has gotten us into trouble. And while that trouble is a major thing, I still think the benefits were worth it, though it is a pity we couldn’t have stopped before things got to the state they are currently in. I am particularly irritated when I hear ivory tower intellectuals bemoaning the failings of technology when their lifestyle is completely dependent on very complex technology, of which they are largely unaware. Lewis Mumford’s book “Technics & Civilization” comes to mind--let’s just say I laid it down in disgust before finishing. But I am also pretty irritated with people who say “surely they’ll come up with something”, and are willing to just leave it at that, trusting that "they" will indeed look after it. A pretty unjustified leap of faith, I’d say. Many people believe technological breakthroughs will soon give us access to sources of energy as rich or richer that fossil fuels and let business continue on as usual, or perhaps even better than usual. Others think that we can find a way to maintain our current lifestyle by using renewable energy sources and improving the efficiency with which we use that energy. I don;t agree with either of those ideas. I’ve spent quite a few years researching this subject and I will share my conclusions shortly, but I can recommend a couple of writers who will lead you through this in more detail than I have space for here. 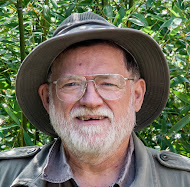 Tom Murphy is a physicist whose blog Do the Math does an excellent job of just that--doing the math. David MacKay is an engineer whose book “Sustainable Energy -- without the hot air” is another valuable resource. It’s contents are available on line at http://www.withouthotair.com/. Both writers are accessible to anyone who was comfortable with high school math, and even if numbers aren’t your friends, they also make their conclusions clear in simple English. But now for my conclusions. One thing to get clear is that technology is not energy, indeed technology uses energy, rather than creating it. Many people are confused about this because we do use technology to access sources of energy and convert them into more useful forms. During recent history technological advances have allowed us to access more sources of energy than ever before. But make no mistake, if you don’t have a prime mover, a source of energy, all the technology in the world isn’t going to help. So, can we find a way to make our “business as usual”, growth based economy keep going for the foreseeable future? This means finding a way to keep an ever growing population fed, housed, clothed and entertained to an ever improving standard. Energy seems to be the key and by looking closely at energy, we can find some answers. There are indeed huge quantities of hydrocarbons (fossil fuels) trapped underground in rock formations where we can’t access them at the moment. Let’s assume technology improves and allows us to access those resources. Enough to last several hundred years, which for many people is effectively forever. At any rate, long before we run out of those resources, sometime in the next few decades, we will have released such vast quantities of carbon dioxide into the atmosphere that climate change will spoil the future we are trying to build here. I don’t usually argue that near term extinction for the human race is a possibility to take seriously, but that would be one way to make it a reality. OK, can we tap into some cleaner sources of energy? What about nuclear fission or maybe even nuclear fusion? Fissionable materials are pretty rare and every analysis I read says that if we built fission reactors to replace fossil fuels as our energy source, we’d run out of fissionable materials in a few decades. Yes, there’s thorium as well as uranium and there are breeder reactors. That would get us a few more decades. But not enough to last into anybody’s definition of the foreseeable future. But there is enough fusion fuel (heavy hydrogen) in the oceans to last a very long time. We don’t have working fusion reactors yet, but maybe it’s time we doubled or quadrupled the research budget (instead of halving it, as we recently did to the funding for one fusion research project) and get the problem solved. Once we can tap into nuclear fusion as an energy source, our problems are solved, right? Wrong. The process of making usable energy from any of these resources, gives off quite a lot of waste heat. This isn’t some failing of insufficiently advanced technology, but a simple consequence the laws of thermodynamics. Typical power plants runs with an efficiency of 25 to 35 percent. The rest of the energy ends up in the environment. The downside of fusion is that it can keep us going long enough for that to be a problem. If our civilization keeps on as it is for a few hundred more years, we’ll have released enough waste heat to boil the oceans. This is quite a lot worse than the few degrees of warming we’d get from releasing more greenhouses gasses into the atmosphere. And it is not dependent of which energy source we choose — whatever it is, if it allows us to continue growing for a few hundred years, we end up with this problem. Another deal breaker, for sure. What about space resources and generating power off the planet so we don’t have to worry so much about waste heat? Solar power stations in orbit, beaming energy down to receiving stations here on earth. This just puts the waste heat problem off for a few hundred more years, since we’d still be adding some heat to the environment. In order to radiate it away, the temperature has to go up. If we keep growing, eventually it becomes a problem. Some of you will be jumping up and down in frustration at all the other problems with any of these idea, that I appear to be ignoring. I am aware of those problems, and I agree that the analysis above is pretty cavalier. But I’m trying to show there are fundamental problems that stop these ideas from working even before we consider more subtle issues. Perhaps the problem is growth. I would certainly say so. What if we stop growing and switch over to clean, renewable energy sources? The wonderful thing about such a plan is that it is simplicity itself to implement. We just keep going as we are at present and let nature take its course. Climate change and the end of industrial agriculture as fossil fuels run out would reduce the human population to a fraction of it’s present level. Before many decades passed, we’d be back to firewood and food as energy sources. Straight back to the dark ages, though with the benefit of what knowledge we can retain from the industrial era and all the refined metal and machinery that will be lying around waiting to be salvaged, maybe not quite as far back as you might think. I often think that if we had switched over to a non-growth based economy in the first half of the twentieth century, things would have been much simpler. With a smaller population and concerted efforts to conserve, to get by on “just enough”, the supply of fossil fuels would have lasted much longer and climate change not have become a problem until much later in the game. This would have given us a much better chance to succeed at a transition to renewable energy sources. The “just enough is good” attitude, especially, would make this easier to accomplish. As opposed to our current “more is always better” and “waste is our entitlement” approach to things. But...woulda, coulda and shoulda are futile words. As I said earlier, many think that we can find a way to maintain our current lifestyle and continue with "sustainable growth"(whatever that may be) by using renewable energy sources and improving the efficiency with which we use that energy. That is not what I am saying “maybe” to. It seems to me that retaining the benefits of science and technology is a vastly more attainable goal than maintaining our current lifestyle. Let’s consider why renewables can’t support an industrial society of the sort we currently have. When it comes to energy, it’s not just the amount of energy that is available to us, but also the difference between what it costs us to acquire the energy and the value of what we can produce with it – the “surplus energy”. This can be represented by a single number, the Energy Returned on Energy Invested or “EROEI”. This surplus energy is what fuels productivity, and makes our economy grow. You can average together the EROEI’s of all the energy sources that an economy uses. When that number goes below a certain level (around 15), the economy ceases to grow and goes into a recession. “Capital formation”--raising money to start projects becomes difficult. As the number goes lower, it becomes difficult even to raise enough money to maintain vital infrastructure and things start to crumble. I scanned the graph above from Tim Morgan’s book, Life After Growth. The red line at EROEI=15 is mine. The horizontal axis represents EROEI, and that quantity decreases are we move from left to right. The vertical axis represents the percentage “profit” of gross energy extracted. 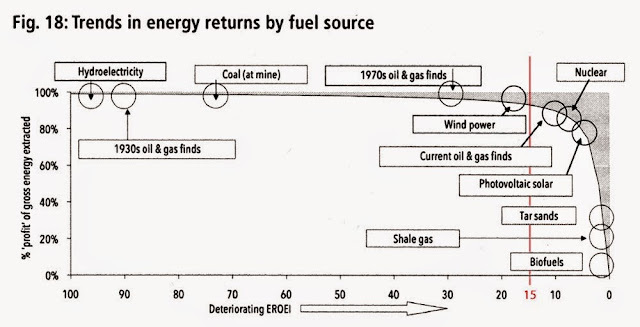 The graph shows the EROEI of the various energy sources that are available to us. If a country is looking to develop new energy sources to improve its economic situation, it needs to pick sources that will improve its average EROEI. Spending money on energy sources with an EROEI of less your current average actually make things worse. Most of the developed nations have an average EROEI around 9 to 12 these days. Nuclear fusion is not on the graph, presumably because there are no working fusion reactors to get data from. But it is proving much harder to build them than it was to build fission reactors, so it is a pretty good bet that if we do build them, their EROEI will be even worse that fission reactors, which are in the 8 to 10 range. The EROEI’s quoted there vary a little from Morgan’s diagram, but none of these numbers are meant to be taken a terribly precise. Heinberg tells us that wave energy systems have an EROEI of around 15, geothermal 2 to 13, and tidal around 6. So, I have introduced several criteria for evaluating energy sources: long term considerations like waste heat, emission of greenhouse gases, availability of a long term supply or renewability, and perhaps most important, having an EROEI of greater than 15. It is also important to realize that if an energy source requires the infrastructure provided by an high tech industrial economy to make it work, but has an EROEI of less than 15 then it cannot support the sort of economy that is needed to make it work. Eventually the infrastructure will crumble and that energy source will no longer be accessible. Off the top of my head I would say this applies to nuclear fission and solar photovoltaics in particular. If we are looking to maintain a growing industrial civilization we can quickly eliminate all the energy sources to the right of the red line on the graph. High tech isn’t going to help with that, because using more complex technology will tend to lower the EROEI, not raise it, because of the extra energy needed to build and run such equipment. So let’s look at the energy sources on the left side of the graph. Wind is intermittent and I do not believe that this has been taken into account in calculating the EROEI shown on the graph. When you add in the cost of storage equipment or companion generation needed to fit wind into a grid that is committed to supplying continuous and reliable power, the EROEI is much worse. That is why I would move wind to the right of the red line on the graph. 1970s oil and gas finds are moving into the decline phase at the end of their lives and that is what is causing our current energy crisis. Non-renewable energy sources tend to move to the right on this graph as they become depleted, because we always use “pick the low hanging fruit first”, leaving the poorer quality, harder to access parts of the resource for later. Note also, that current oil and gas finds are over on the right side of the graph. The vast amounts of hydrocarbons still in the ground all have a very low EROEI, sometimes less than 1. Hypothetical discussion about there being enough fossil fuels left to last hundreds of years tend to ignore this. Coal has a good EROEI, but that is for coal sitting at the mine head. Transporting it to a power station and burning it to produce electricity reduces the EROEI considerably, probably by a factor of 3, down to 25. Using it to replace oil and gas will result in vastly increased emissions of carbon dioxide. Schemes for capturing the CO2 and keeping it out of the atmosphere have been suggested, but energy is used in those schemes, from 10 to 40% of the energy in the coal being burned. So if we have to capture and store the CO2 released by burning coal its EROEI starts to get down close to or below 15. And the technology to do this hasn’t been developed yet. Further, coal extraction is moving toward a peak just like oil and natural gas, which may come as soon as 2025. Already we have used up most of the high quality coal and have been forced to mine the lower quality stuff. Obviously, 1930s oil and gas finds are history. Hydroelectricity is fine and no doubt the few remaining suitable locations will be developed. But there just isn’t enough to replace fossil fuels. But what about proposed energy sources that haven’t yet been built, so there is no EROEI data to evaluate? 1) Energy sources which fail for the reasons I’ve already discussed, though perhaps in a less obvious ways. 2) Things that are science fiction--just not physically possible. The academic-reactor designer is a dilettante. He has not had to assume any real responsibility in connection with his projects. He is free to luxuriate in elegant ideas, the practical shortcomings of which can be relegated to the category of "mere technical details." The practical-reactor designer must live with these same technical details. Although recalcitrant and awkward, they must be solved and cannot be put off until tomorrow. Their solution requires manpower, time and money. Unfortunately for those who must make far-reaching decision without the benefit of an intimate knowledge of reactor technology, and unfortunately for the interested public, it is much easier to get the academic side of an issue than the practical side. For a large part those involved with the academic reactors have more inclination and time to present their ideas in reports and orally to those who will listen. Since they are innocently unaware of the real but hidden difficulties of their plans, they speak with great facility and confidence. Those involved with practical reactors, humbled by their experiences, speak less and worry more. 4) Similar to mistaking academic ideas for practical ones, is the tendency to assume that if something needs to be done, the means to do it will be found. In a failing economy (EROEI less than 15) finding the means to do anything much is very challenging. In fact it is a major concern that we won’t be able to scrape together cash to do many possible and practical things which would improve the situation. 5) Energy sources will scalability problems. Sources that pass all the other tests but exist such small quantity that they can’t be scaled up to solve our problems. Burning waste is one such example. Yes, some energy can be generated by incinerating garbage. But there is only so much garbage and scaling up the creation of garbage is not something we want to do. As the economy declines further, there will be less. Indeed much of what needs to be done will result in much less garbage being created. So its potential as a source of energy will decline as time passes, instead of increasing. All of this is why I don’t think technology offers much hope of enabling “business as usual” to continue as usual. Indeed, I don’t believe there is much chance of that happening at all. I’d like to close by suggesting that maybe we are looking at things from the wrong angle. What if we could change our requirements for energy to fit what’s available? I’m not primarily talking about efficiency here, especially the sort of efficiency improvement that adds complexity and cost and lowers EROEI. What I am talking about, yet again, is lifestyle changes. This seems to be a taboo subject, but I appears to me to be the one real answer. There just aren’t any energy sources that will support a growing high tech society on an on-going basis. But it seems to me we could have a non-growing (steady state) society at a somewhat lower level of population, technology and resource use, without falling all the way down to the seventeenth century, or worse yet, the stone age. I am on record as saying that I expect our industrial civilization will collapse over the next few decades. But I am definitely not talking about some sort of apocalypse. I expect this fall will be a bumpy but gradual one. As it collapses the ability of our industrial civilization to provide the necessities of life will decrease and we will be left to fend for ourselves. There is much that can be done to reduce how far the decline goes and to lessen the abruptness with which it occurs. Efforts in that direction have to be applauded for their potential to reduce human suffering. In my next post I’ll consider what a government that wasn’t shackled by “political realities” could do to mitigate the effects of the collapse. Actually there are a lot of people writing about this, and doing a better job than me. I'm just writing so that my friends and family have a chance to hear about all this. I can't say I'm happy about it either, but I think it is good to be at least mentally prepared. There has been a rash of suicides among bankers and other financial people over the last few months. One can only imagine that the prospect of "business as usual" coming to an end is just too much to face up to. I don't think governments can do a whole lot to stop what's going on, but they could do a lot to make it easier to adapt to. Unfortunately, it's more likely that they will just keep on making things worse.